I was able to get three heads of cabbage out of the garden this week. I plan my menu monthly so I didn’t have my favorite cabbage meal on the menu for right now so I prepared the it for the freezer. I didn’t know if this was possible, but found some easy directions out there. The first thing I did was to soak the heads of cabbage in some salt water for a few hours. This helped to pull out any remaining worms that might have been inside the heads. I then washed them really good and cut them in to quarters. I then brought a large pot of water up to a rolling boil on the stove. I placed it in the boiling water for approximately 3 minutes to blanch it. I then removed the cabbage and placed it in an ice water bath to stop the cooking process. After letting it cool down for a few minutes, I removed the cabbage to a colander and let it sit and drain for 30 minutes. 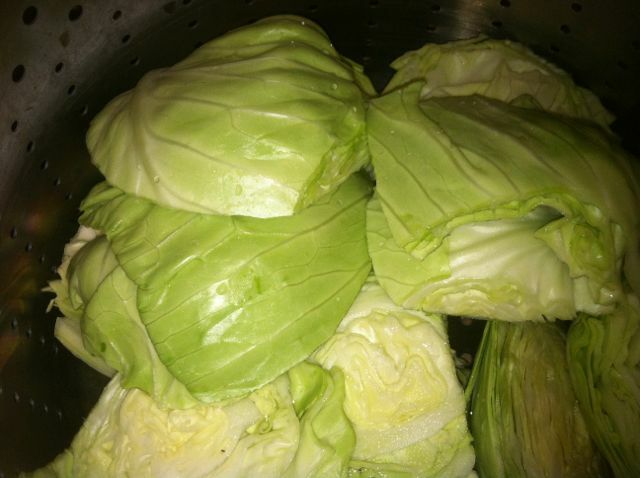 You want as much of the water off the cabbage before you freeze it as you can get. I then separated the cabbage that I had in to two freezer bags, removing as much air as possible and placed them in the chest freezer. The cabbage should be OK in the freezer for up to 12 months. The consistency of the cabbage will be a bit different after it being frozen. You won’t want to use this in a recipes that call for raw cabbage, like slaw, since you have started the cooking process by blanching it. Most other recipes that require cooked cabbage or simply boiling it like I do, will work just fine with cabbage that has been frozen. I will leave the cabbage in the freezer, along with the beets, until I have some potatoes later in the season. Then I will fix my favorite meal of all time: boiled cabbage seasoned with butter, salt, pepper, and paprika; Harvard beets; and mashed potatoes – all from my garden! I can’t wait!